Σήμερα θὰ σᾶς μεταφέρω τὰ σχόλια ἀπὸ ἕνα ταινιάκι ποὺ μοῦ ἔστειλαν. Μία παρατήρησις, πρὶν σᾶς τὰ παρουσιάσω. 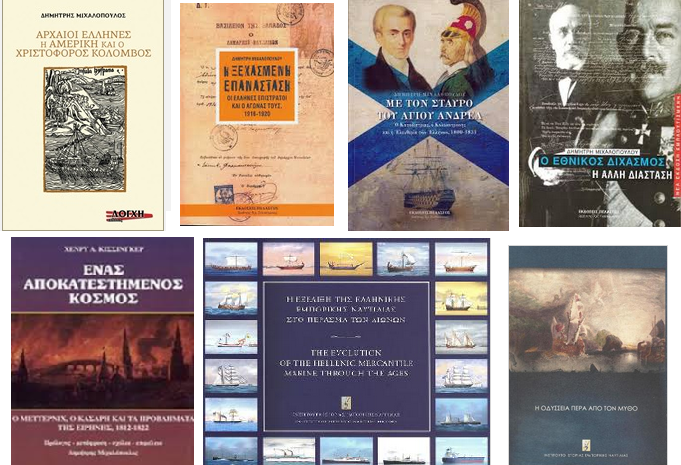 Αὐτὴ ἡ πόλις, ἡ Ἀστανᾶ, εἶναι στὸν Καύκασο. Ἐκεῖ ὅμως συμβαίνουν καὶ πάρα πολλὰ ἄλλα πράγματα τὸν τελευταῖον καιρό. Προσέξτε στὸν χάρτη τὰ σύνορα. Προσέξτε τὴν θέσι τῆς Ἀστανᾶ. Ἐπίσης τὴν, ὄχι καὶ τόσο μακρινή, θέσι τῆς Συρίας. Τὴν γεωγραφικὴ θέσι τῆς Τουρκίας μὲ ὅλα αὐτά! Καὶ κρατῆστε τα! Θὰ παίξουν μεγάλον ῥόλο ὅλες αὐτὲς οἱ περιοχές, αὐτὴ ἡ πρωτεύουσα καὶ ὅλα τὰ νέα ἐπεισόδια ποὺ καταγράφονται στὸ ἐπόμενον χρονικὸ διάστημα. Μία πόλη σχεδὸν ἄγνωστη στὸν περισσότερο κόσμο. Κάποιοι ἤξεραν τὴν ὕπαρξή της ἀλλὰ δὲν γνώριζαν τὴν σημασία της καὶ ἄλλοι, ἁπλὰ ἠξεραν ἀλλὰ δὲν μιλοῦσαν γιὰ νὰ μὴν ταράξουν τὰ νερὰ πρὶν τὴν ὥρα τους. Ὅσο δὲ γιὰ τὰ Μέσα Μαζικῆς Ἐξαθλίωσης βέβαια οὔτε λόγος· οἱ ἄθλιοι μικροὶ θαυματοποιοὶ (δημοσιογράφοι), ἦταν ἀπασχολημένοι μὲ τὴν ὑποστήριξη τῶν ἀνθρωπίνων δικαιωμάτων, ἀπάντων τῶν ἀνθρώπων –πλὴν Ἑλλήνων- ὅπως καὶ τὴν ἀνάδειξη τῶν μουσουλμανικῶν ἀξιῶν καὶ τοῦ ὀθωμανικοῦ πολιτισμοῦ, ἔναντι τοῦ «μιαροῦ» ἑλληνικοῦ τοιούτου, φυσικὰ μὲ τὴν συγκατάθεση τοῦ τούρκου ταγματάρχη, κεφαλῆς τῆς ὀρθόδοξης (παράδοξο), ἐκκλησίας, οἰκομενικοῦ πατριάρχη Βαρθολομαίου. Σὲ αὐτὴ τὴν πόλη λοιπὸν συναντῶνται οἱ ἰσχυροὶ τοῦ πλανήτη, παπᾶδες κυβερνητικοὶ καὶ στρατιωτικοὶ καταπατώντας τοὺς ὅρκους ποὺ ἔχουν κάνει γιὰ νὰ ἀποκτήσουν τὰ ἀξιώματά τους καὶ προδίδοντας τὶς θρησκεῖες καὶ ἐθνικὰ συμφέροντά τους γιὰ τὴν ἐπιβολὴ τῆς παγκοσμιοποιήσεως καὶ τῆς πανθρησκείας ἐν ὀνὀματι τοῦ κέρδους καὶ τῆς ἐπιβολῆς ἐξουσίας σὲ ὁλόκληρη τὴν ὑφήλιο. Καὶ ὅλα αὐτὰ «γιὰ τὸ καλό μας». Ἐπειδὴ ἐμεῖς δὲν γνωρίζουμε τὸ καλὸ καὶ συμφέρον μας, δὲν ἔχουμε τὴν δυνατότητα νὰ σκεπτόμαστε, δὲν ἔχουμε τὸ δικαίωμα νὰ εἴμαστε ἐλεύθεροι. Ὅσο ἀκοῦμε αὐτὰ ποὺ λένε καὶ δεχόμαστε τοὺς παραλογισμούς τους, τόσο πιὸ δύσκολα θὰ ξεφύγουμε ἀπὸ τὰ νύχια τους. Πηγὴ βίντεο: Ἡ δημοσίευση τοῦ βίντεο, ὁπως καὶ ὁ ὑποτιτλισμὸς ὀφείλουν εὐχαριστήρια στὸν kryfos0kosmo γιὰ τὴν ἐργασία καὶ προσφορὰ του στὸ κοινὸ ποὺ ἀνησυχεῖ μὲ τὴν τροπὴ τῆς ἀνθρωπότητας σ᾽αὐτὲς τὶς δύσκολες ὥρες. 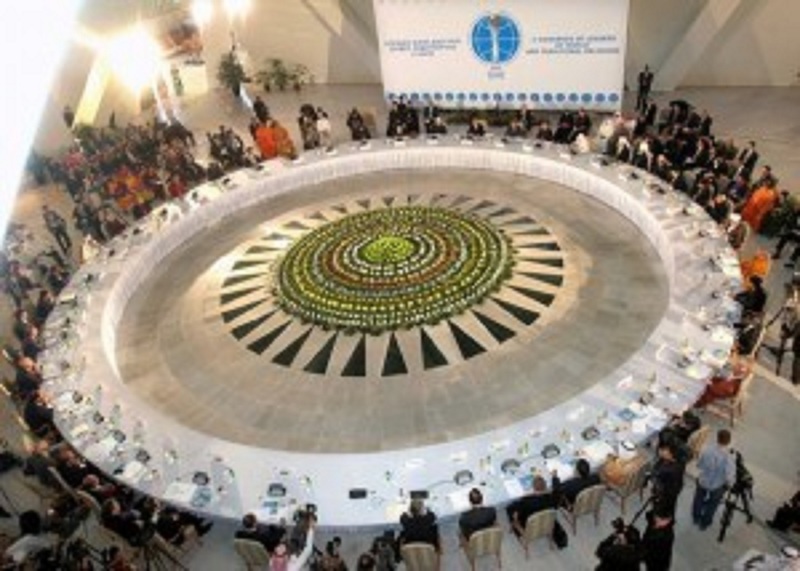 On 17 March 2011 Astana hosted a meeting of defence ministers of the SCO member states. 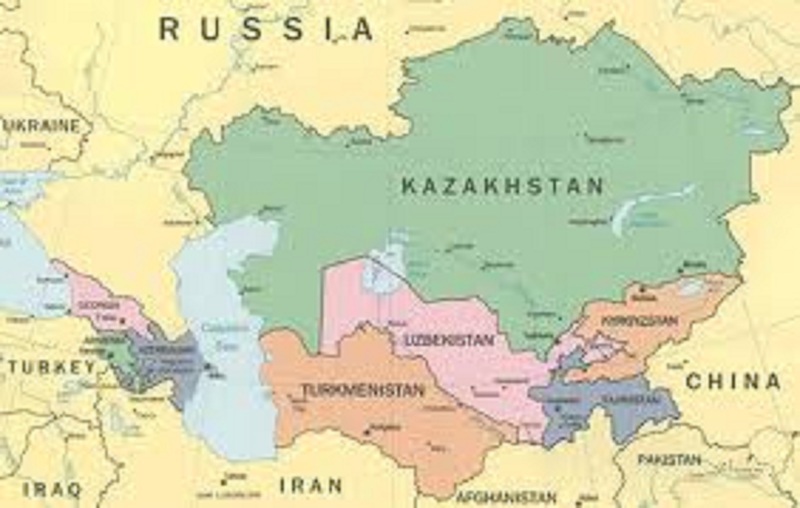 The meeting was held under the chairmanship of A. Djaksybekov, the defence minister of Kazakhstan. 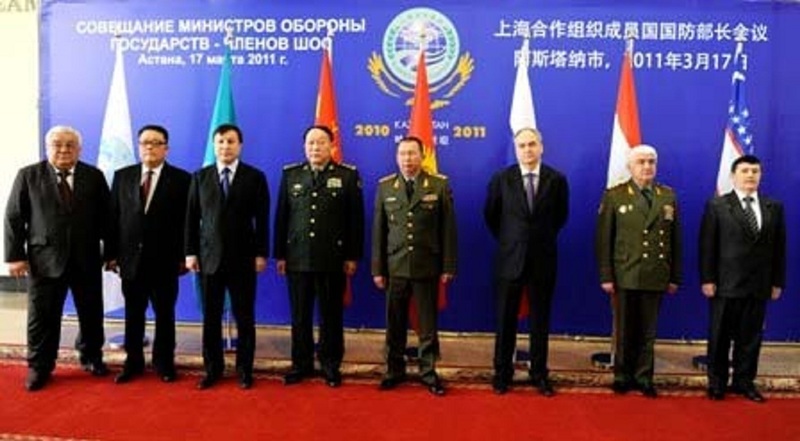 The national defence minister of China Liang Guanglie, the defence minister of Kyrgyzstan A. Kudayberdiev, the deputy defence minister of Russia A. Antonov, the defence minister of Tajikistan S. Khayrulloyev, the SCO Secretary-General M. Imanaliev and the SCO RCTS Director D. Djumanbekov were in attendance. During the meeting the ministers approved the cooperation plan among the defence ministries of the SCO member states for 2012-2013, and signed a joint communiqué. 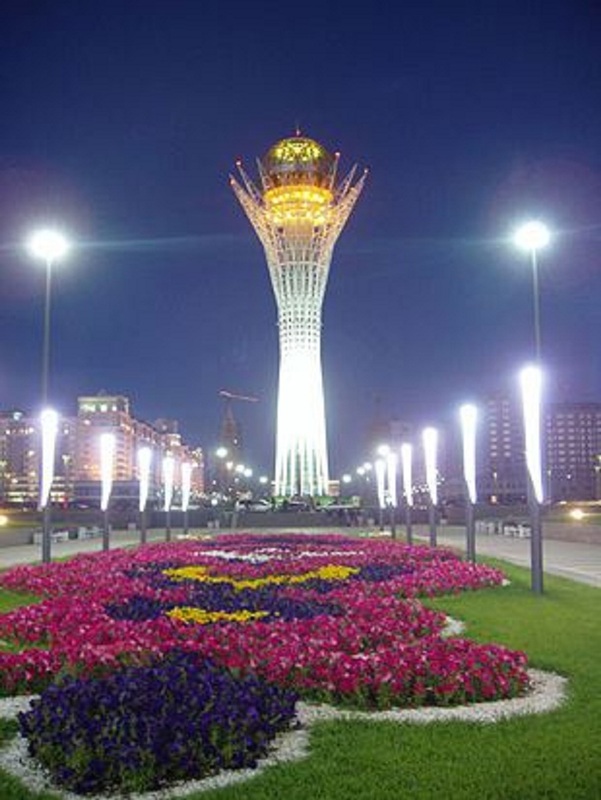 Astana is the first capital being built in the 21st century and it perfectly represents where the world is headed. 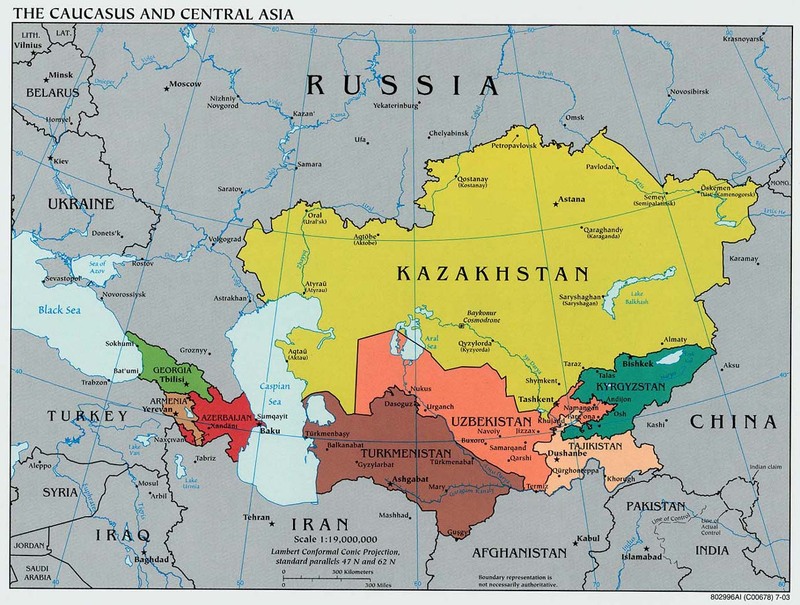 It is truly one man’s vision: Nursultan Nazarbayev, the president of Kazakhstan (yes Borat’s country, I know). 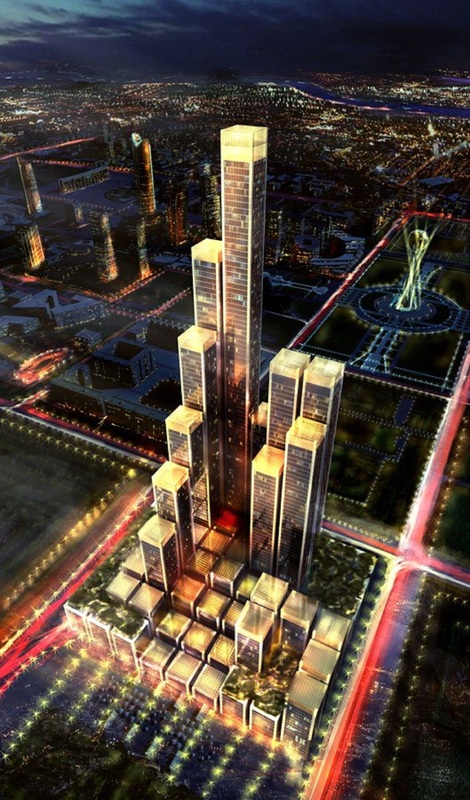 Backed by billions of petrodollars, the city is being built from scratch in a remote and deserted area of the Asian steppes. The result is astonishing: a futuristic occult capital, embracing the New World Order while celebrating the most ancient religion known to man: Sun Worship. The city is still a huge construction site, but the buildings that are already completed already sum up Nazarbayev’s occult vision. Conceived by Britain’s most prolific architect, Lord Norman Forster, this giant pyramid is an odd presence in the middle of the Asian Steppes. 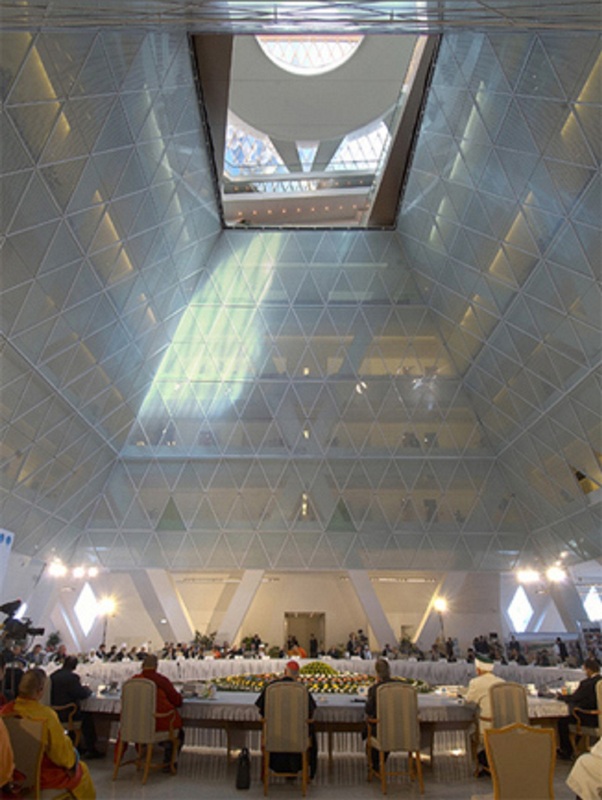 The building is dedicated to “the renunciation of violence” and “to bring together the world’s religions”. Norman Foster has said that the building has no recognizable religious symbols to permit the harmonious reunification of confessions. 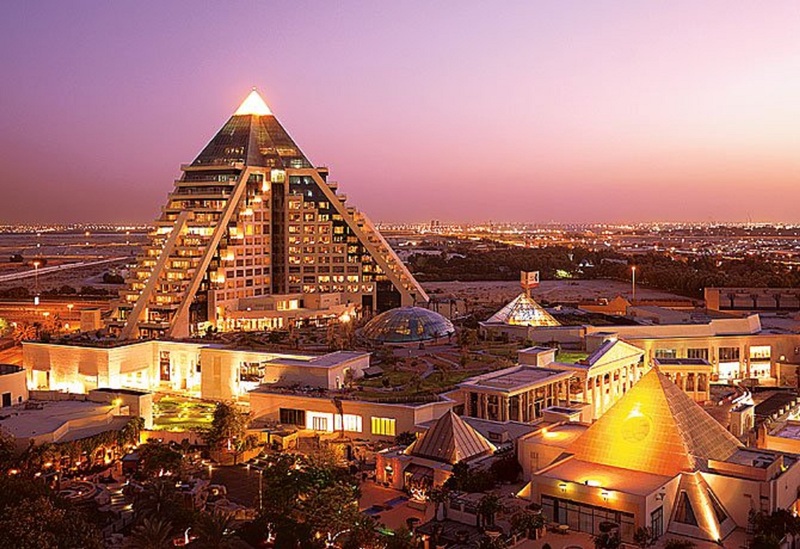 In reality, the pyramid is a temple for the occultist’s only TRUE religion: Sun worship. A journey inside this building is a truly symbolic one. It represents each human’s path to illumination. Let’s take the tour. 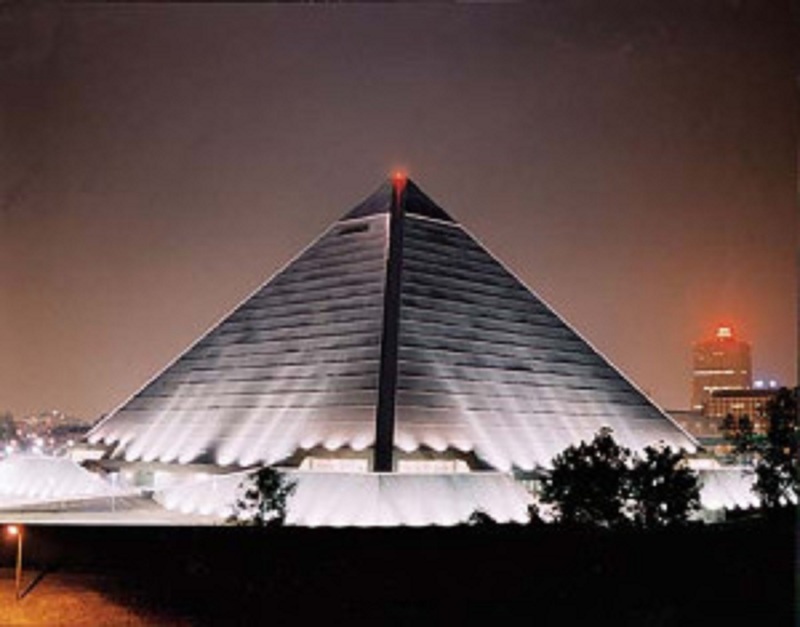 As Manly P. Hall stated, the pyramid is the ultimate symbol representing the mysteries of ancient civilizations. Sublime in their simplicity, divine in their proportions, they embody both the divine knowledge owned by the illuminated and the bewilderment of the masses. Today’s elite, initiated to the occult, are the heirs of this ancient wisdom and use the pyramid as a symbol of power in the modern world. The illuminated/floating/missing capstone represents the divine principle present in the universe as well in each human being. 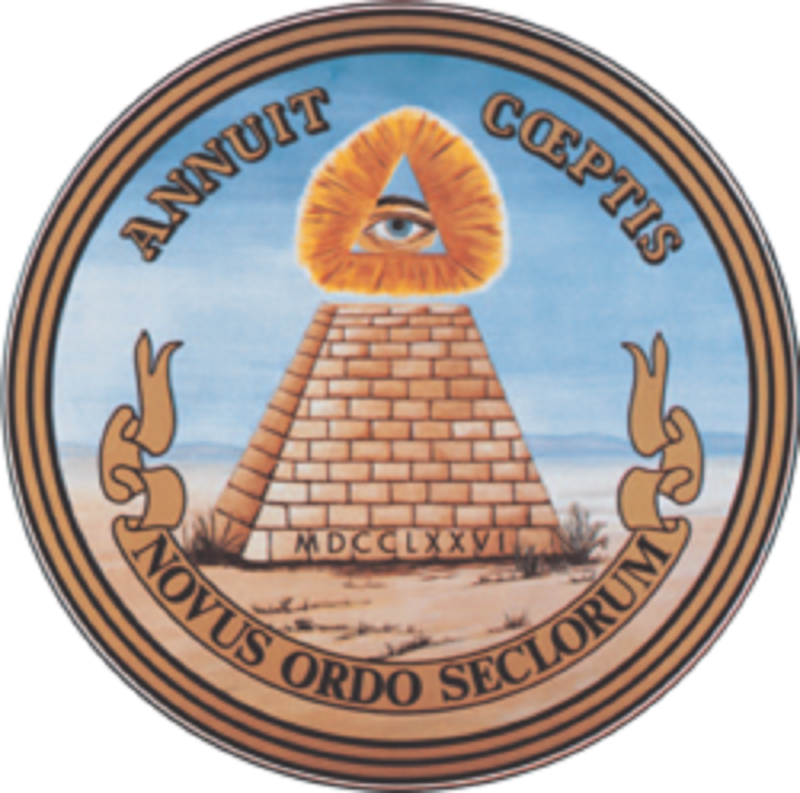 Another symbolic meaning attributed to the missing capstone is the unfinished nature of the New World Order. It is said that the capstone of the Great Pyramid will be reinstated when this age old project will become reality. Here are other pyramids appearing across the world, representing the elites power over the masses. 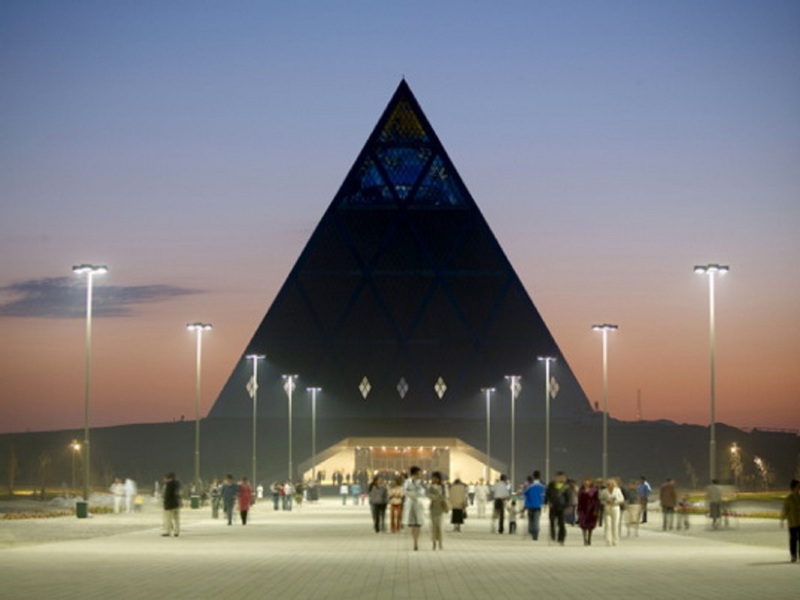 When entering the pyramid at ground level, the interior is dark and cavernous. 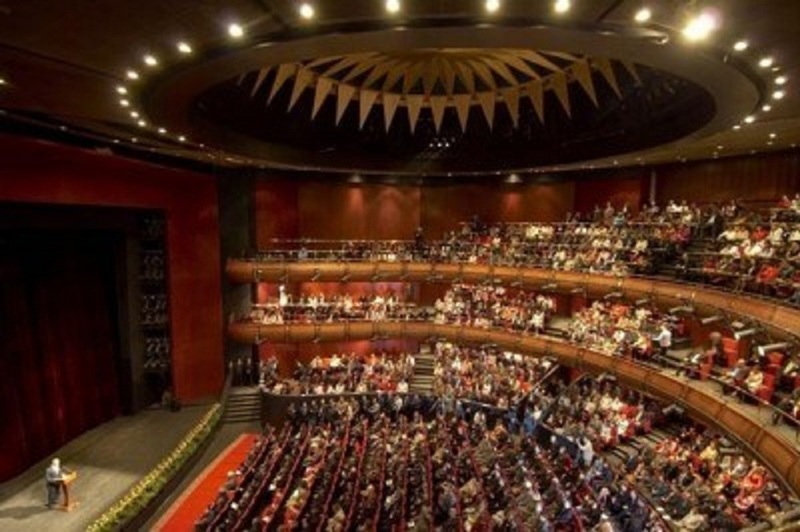 The basement houses Astana’s opera house, where the unsuspecting mass gets entertained. Despite the darkness, a huge image of the sun occupies almost all of the ceiling. Right on top of the opera house is the central space of the pyramid. 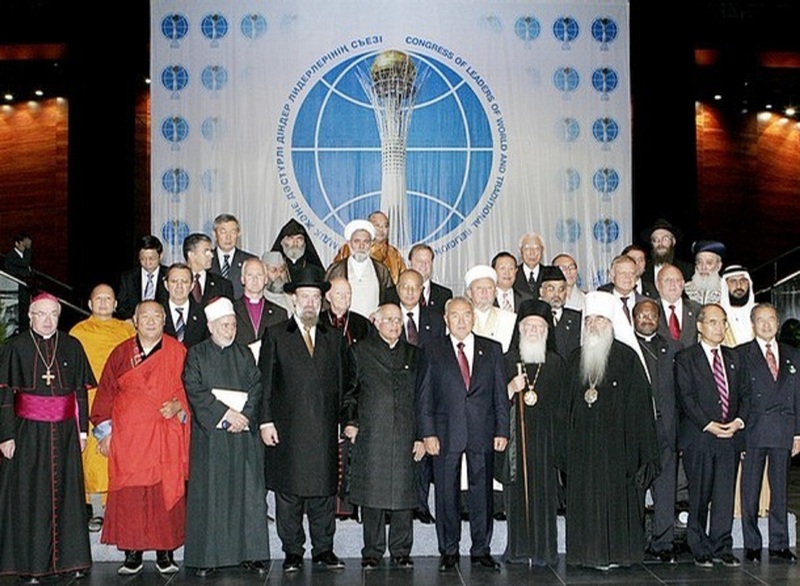 It acts as the meeting room for conferences reuniting religious leaders of the world. Take a minute and soak up the symbolism here. You have religious leaders from around the world sitting around a huge figure of the sun, discussing how to reconcile their differences for the coming New Age. The symbolism is blatant: all these theologies are simply outgrowth of the original object of worship: the Sun. 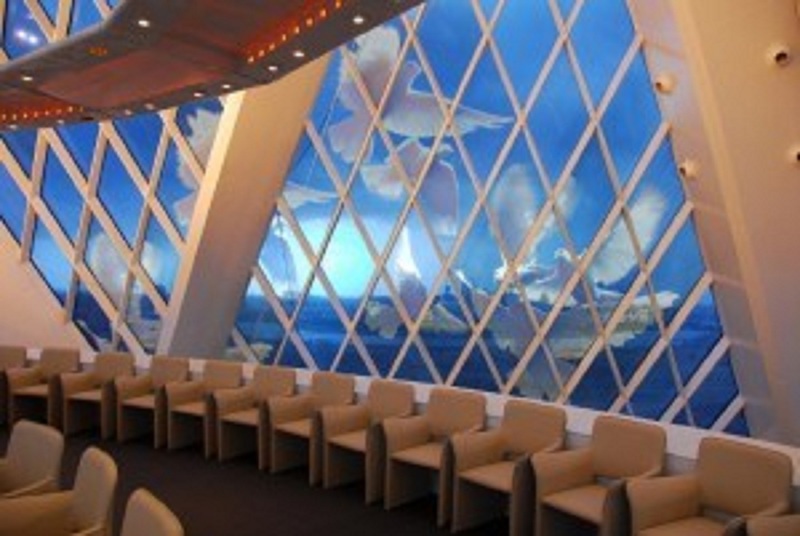 This space is much more luminous than the opera house, representing the progress towards illumination. 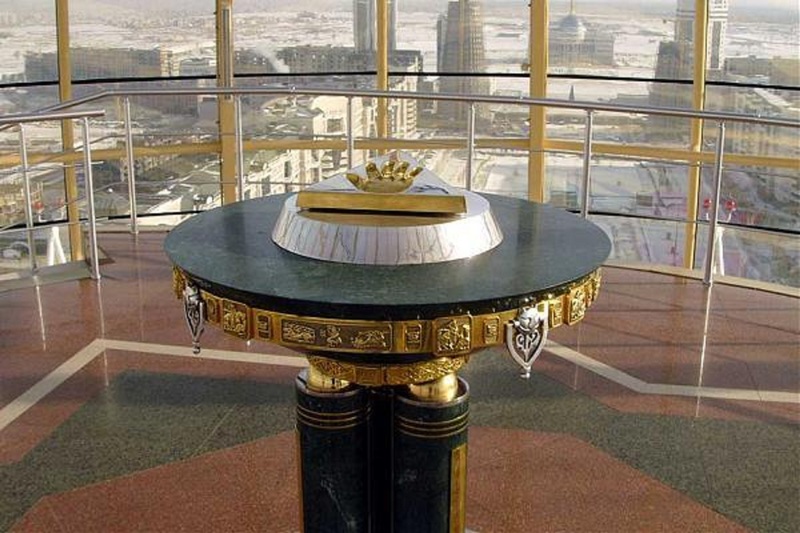 The sun image in the middle of the round table is exactly on top of the sun of the opera house. So while the general population is being entertained in the darkness of the material world, the illuminated, sitting right on top of them, are contemplating how to reach godliness. 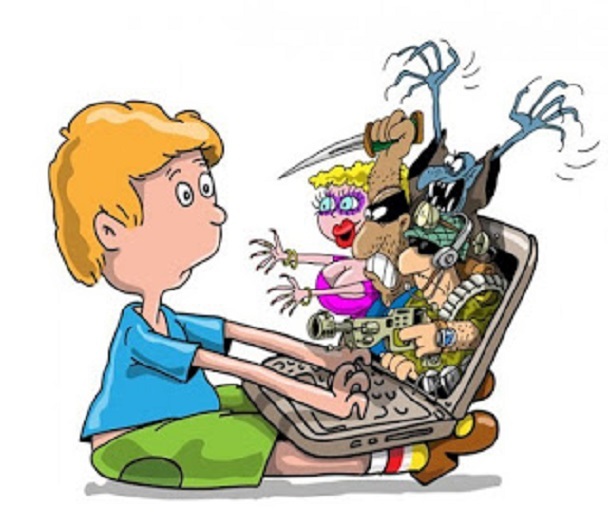 If you read other articles on this site, you might be aware of the objectives of the New World Order. 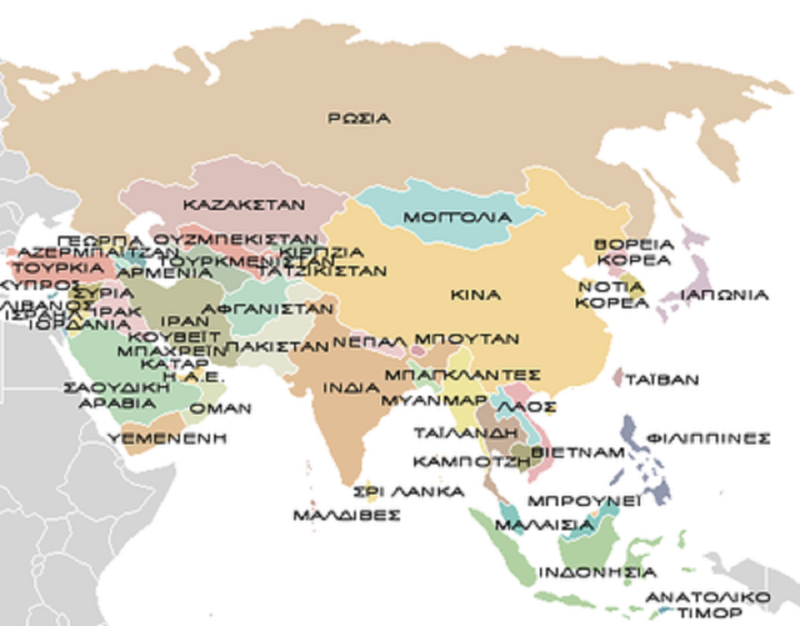 One of them is the replacement of all religions by a form of neo-paganism. This is what those meetings are for. 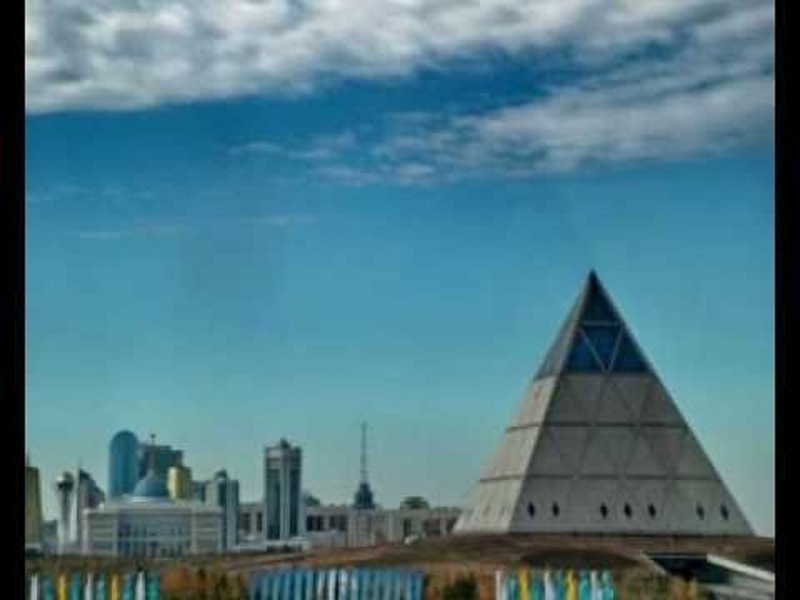 The city of Astana is truly a city of the New World Order. The apex is literally heavenly. It is round, totally windowed and bathing in glorious sunlight. 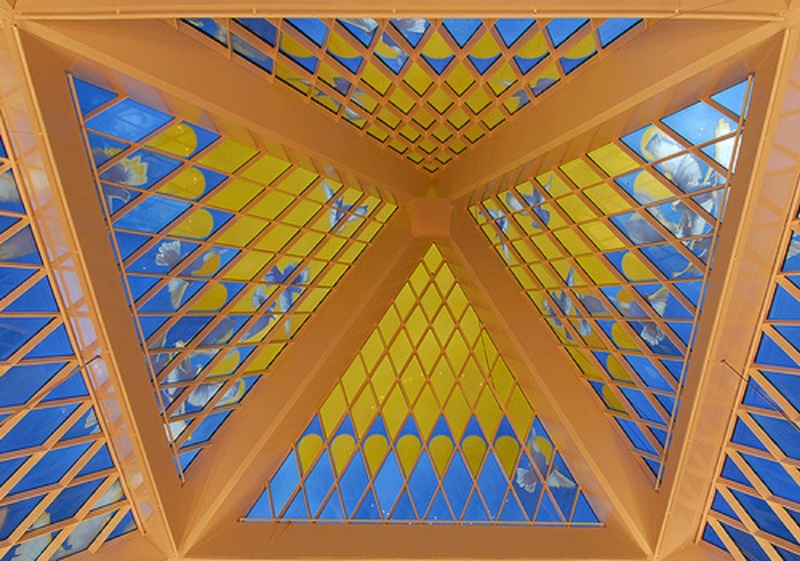 Images of white doves are embedded in the windows, representing peace, which will result in the unification of the world governments and religions in the New World Order. The apex is the ultimate representation of the achievement of illumination, on an individual and on the worldly level. The solar deity is shining upon the illuminated. Beautiful. 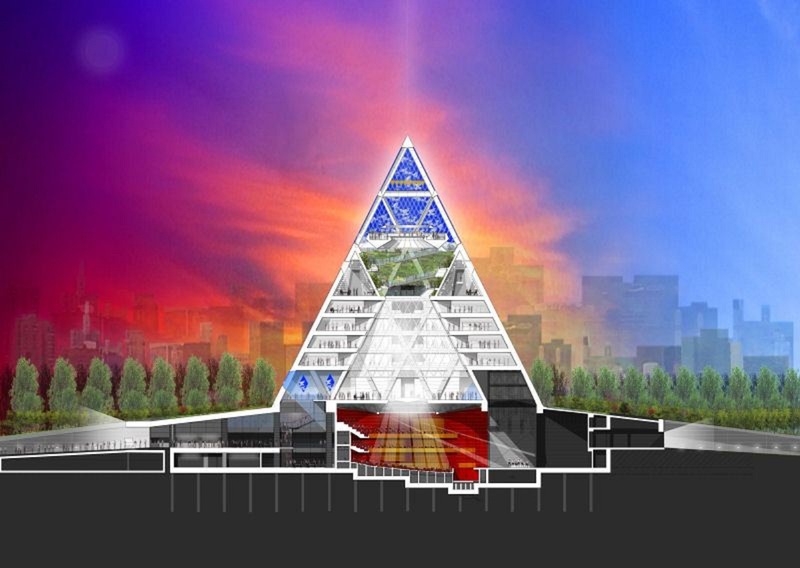 The pyramid’s divisions (the lower dark opera house, the middle conference room and the godly apex) embody the Pythagorean vision of the world. Pythagoras’ teachings are thoroughly studied in today’s occult societies. Pythagoras divided the universe into three parts, which he called the Supreme World, the Superior World, and the Inferior World. The highest, or Supreme World, was a subtle, interpenetrative spiritual essence pervading all things and therefore the true plane of the Supreme Deity itself, the Deity being in every sense omnipresent, omniactive, omnipotent, and omniscient. Both of the lower worlds existed within the nature of this supreme sphere. 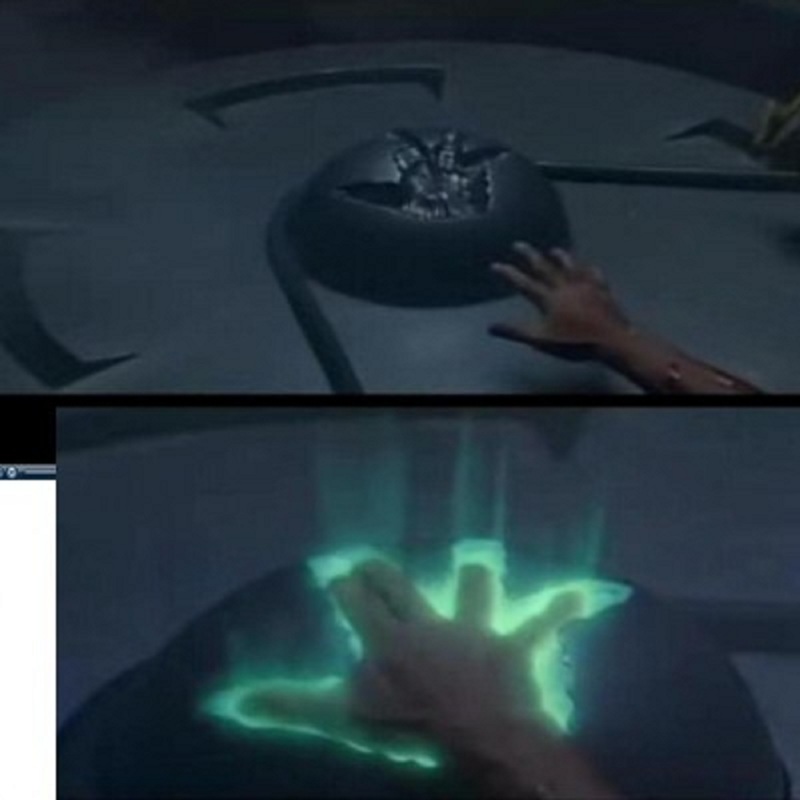 The Superior World was the home of the immortals. It was also the dwelling place of the archetypes, or the seals; their natures in no manner partook of the material of earthiness, but they, casting their shadows upon the deep (the Inferior World), were cognizable only through their shadow. The third, or Inferior World, was the home of those creatures who partook of material substance or were engaged in labor with or upon material substance. Hence, this sphere was the home of (…) mankind and the lower kingdoms, those temporarily of the earth but capable of rising above that sphere by reason and philosophy. In other words, this pyramid, much more than being a tourist attraction, is a representation of the philosophy of the initiates. As Dan Cruikshanks rather cryptically said in his documentary, it is a “representation of the power to come”. Also designed by the distinguished British architect Sir Norman Foster, the monument is meant to embody a folktale about a mythical tree of life and a magic bird of happiness. 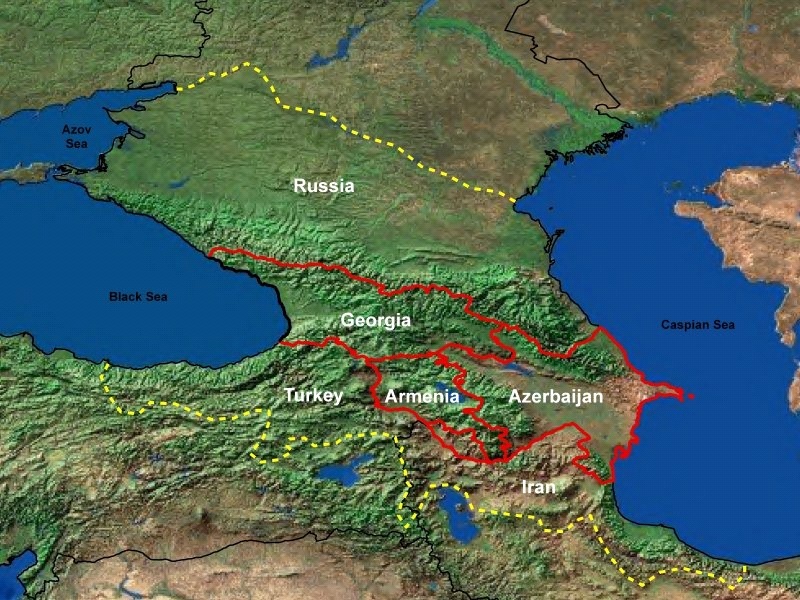 The bird, named Samruk, had laid its egg in the crevice between two branches of a poplar tree. The egg – the golden globe at the top of the monument – represents, once again, the Sun, the Supreme Deity. This “tree of life”, represents the channel through which spirits go to leave the material world and join the divine world. This concept is a recurrent in most (if not all) esoteric societies. 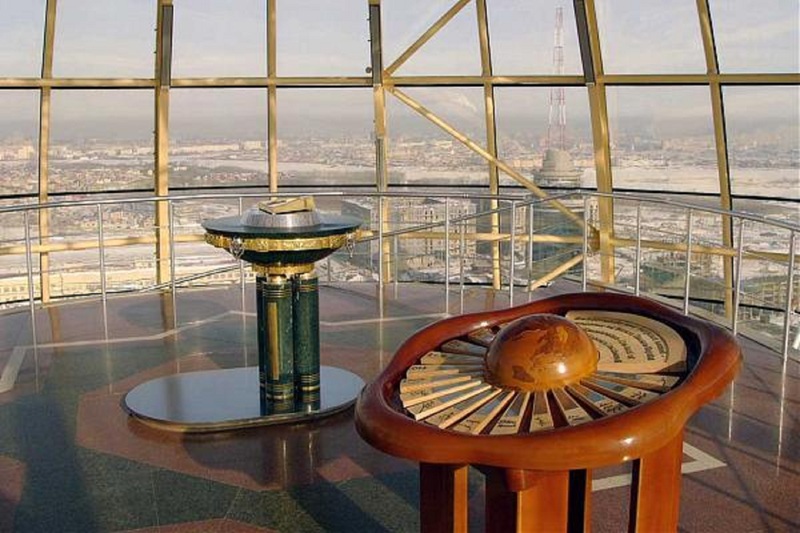 Visitors can go at the top of the tower and get a wonderful view of Nazarbayev’s city. There are also some strange items to look at. Inside the globe we find this enigmatic “thing”. It’s a golden triangle with president Nazarbayev’s handprint in it. Why? I honestly don’t know. All I can say is that it looks like something out of the movie Total Recall. 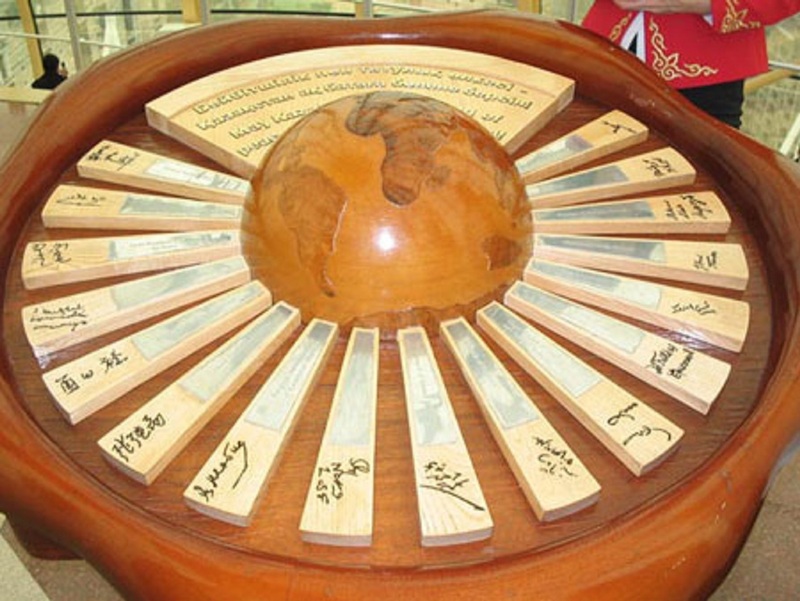 It is a globe signed by representatives from seventeen religious denominations. Yes, once again, talking about uniting all religions into one for the NWO and all of that. Two pillars and one in between, further away. Is there a chance that this may be Masonic symbolism? Yes, the twin golden pillars represent the two pillars of Masonry named Boaz and Jachin. 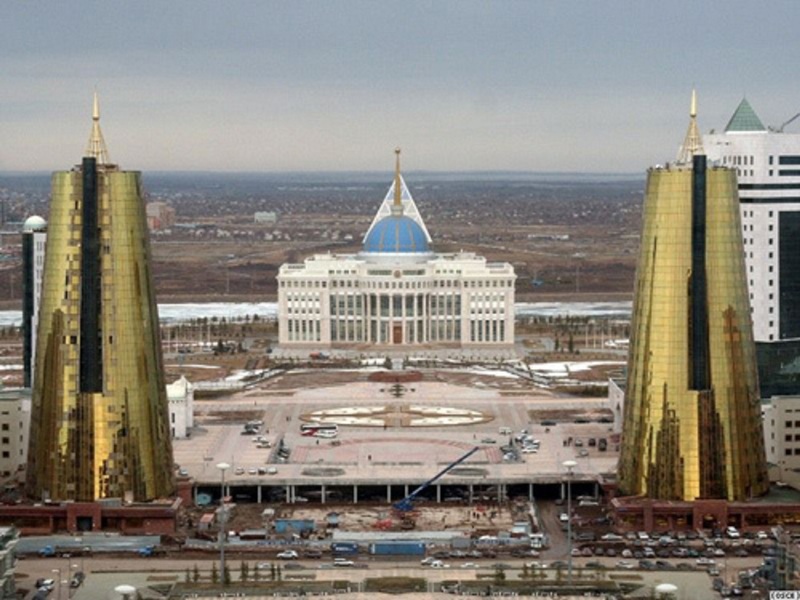 I won’t go into the whole symbolism behind those pillars, but we can probably assume that Nazarbayev is a “Free and Accepted Mason”. 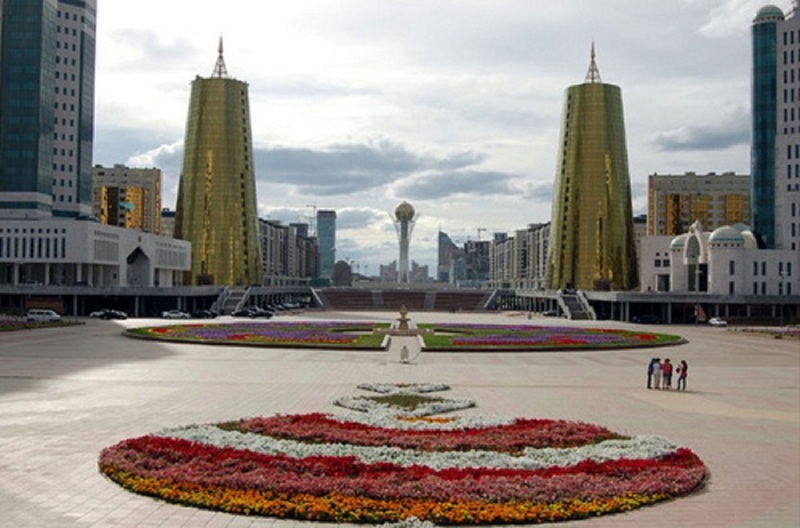 Placed in a commanding position in the city, the Presidential Palace sits at the end of a ceremonial route which starts with the Bayterek tower. A big fat dome sits on top of the palace, representing the female principle, in opposition to the phallic Bayterek tower – the male principle. This layout is present in almost all important cities, including Washington DC and Paris. This unfinished oddity is designed, once again, by Sir Norman Foster (he basically designed the whole city). Underneath the tent, an area larger than 10 football stadiums, will be an urban-scale internal park, shopping and entertainment venue with squares and cobbled streets, a boating river, shopping centre, minigolf and indoor beach resort. It has been said that this structure is made to look like a tabernacle, on par with the Temple of Solomon. These portable places of worship, composed of tents, were used by Jews during biblical times. Initiates attribute to these ancient settlements an esoteric meaning. 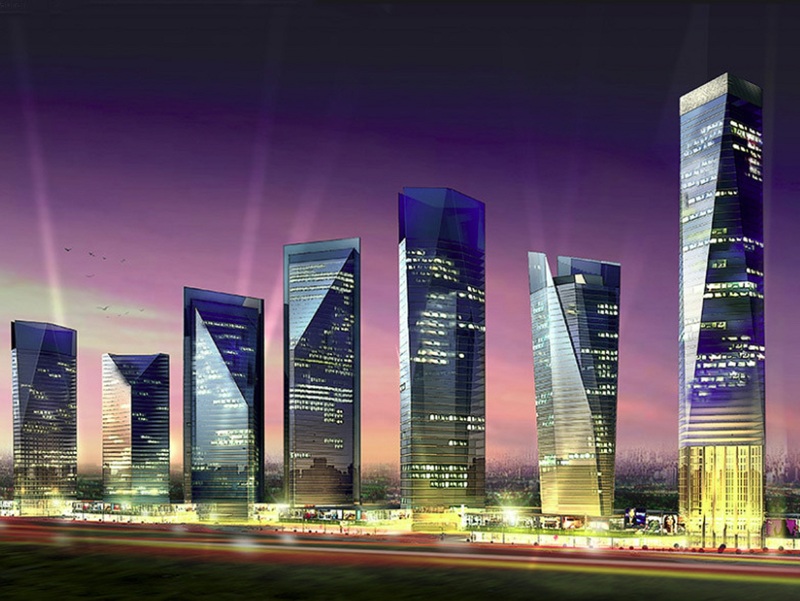 Astana is still under heavy construction, but there are some truly amazing projects in the works. Here are some of them. Designed by our good friend Norman Foster. 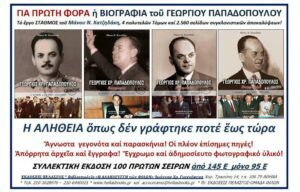 Ἰδοῦ ἡ πρωτεύουσα τῶν «ἀφεντάδων»! Καταχωρίσθηκε στὴν κατηγορία παλαιά καὶ νέα τάξις καὶ σημειώθηκε ὡς Greenpeace, παλαιὰ καὶ νέα τάξις. Φυλάξτε τὸν μόνιμο σύνδεσμο στὰ ἀγαπημένα σας. Ὁ/ἡ Νικόλαος γράφει:	 13 Ἰανουαρίου 2012, 11:53 μ.μ. Καὶ ὡς γνωστὸν αἱ πιπίλαι φέρνουν καλὸν ὕπνον. Καὶ κάτι ἄλλο: Κάπου εἰς τὸ κείμενον ὁ Βαρθολομαῖος χαρακτηρίζεται “Θρησκευτικὸς ἡγέτης”. Ὅμως εἰς τὴν Ὀρθοδοξίαν ἡγέται ΔΕΝ ὑπάρχουν. Κάτιο τέτοια μικρολαθάκια κλονίζουν συνήθως τὴν ἀξιοπιστίαν τῶν γραφόντων! Ὁ/ἡ Φιλονόη ἐκ τοῦ Πόντου γράφει:	 15 Ἰανουαρίου 2012, 12:18 μ.μ. Ὁ/ἡ Νικόλαος γράφει:	 18 Ἰανουαρίου 2012, 1:02 π.μ. Ὄχι Φιλονόη. Προφανῶς ἔχεις ἀπομακρυνθεῖ πολὺ ἀπὸ τὴν Ὀρθοδοξίαν καὶ ἀγνοεῖς τὰς βασικὰς δομάς της. Νὰ ἐπαναλάβω:Εἰς τὴν Ὀρθοδοξίαν ΔΕΝ ὑπάρχουν ἡγέται παρὰ μόνον εἷς ἀρχηγός, ὁ Χριστός (ἄν τὸ δεχόμεθα ἤ ὄχι τοῦτο εἶναι ἄλλη ἱστορία). Ὑπάρχει ἐπίσης μόνον ἕνας βαθμὸς ἱεροσύνης, ἡ τοῦ Πρεσβυτέρου, καὶ ὅλοι οἱ ἄλλοι οἱ νομιζόμενοι ὡς βαθμοὶ δὲν εἶναι παρὰ τίτλοι. 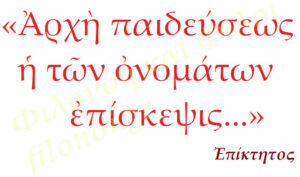 ἤ ἀξιώματα (ὀφίκια) ὅπως αὐτὸ τοῦ Ἐπισκόπου. Προὑπόθεσις διὰ τὴν ὕπαρξιν ἡγέτου εἶναι καὶ ἡ ὕπαρξις ὑπακούων (ὑπηκόων) ἐνῶ εἰς τὴν Ὀρθοδοξίαν ὄχι. Οἱ ἱερεῖς δὲν εἶναι παρὰ ποιμένες λαῶν τοὺς ὁποίους ὅμως δέχεσαι ἤ ὄχι καὶ οὐδεμίαν ὑποχρέωσιν ἔχεις “υπακοῆς ἔναντι αὐτῶν. Προφανῶς Φιλονόη συγχέεις τὴν Ὀρθοδοξίαν μὲ τὸν Καθολικισμόν ἤ Παποστὰν ἄν προτιμᾶς. Τοῦτο εἶναι κάτι τελείως διαφορετικὸν ἀπὸ τὴν Ὀρθοδοξίαν, Δὲν ἀποτελεῖ ἐκκλησίαν ἀλλὰ κοσμικὴν ἐξουσίαν μὲ ἡγέτας, ὁ πρῶτος τῶν ὁποίων, ὁ Ἀρχηγέτης, ἔχει καὶ τὸ θράσος νὰ αὐτοαποκαλεῖται ἀλάθητος, καὶ τὸ χειρότερον ὅλων, ἀντιπρόσωπος τοῦ Θεοῦ ἐπὶ τῆς γῆς, πρᾶγμα τὸ ὁποῖον συνιστὰ τὴν ἐσχάτην τῶν Ὕβρεων. Ὁ/ἡ Φιλονόη ἐκ τοῦ Πόντου γράφει:	 18 Ἰανουαρίου 2012, 2:41 π.μ. Ὅσο γιὰ τὸ ἐὰν ἤ ὄχι ὑπάρχῆ ἐξουσία, καλὸ θὰ ἦταν νὰ βλέπουμε τὴν πραγματικότητα κι ὄχι αὐτὸ ποὺ θὰὰὰὰὰὰὰ ἴσχυε ἐὰν ὅλα ἦταν ἰδεατά. 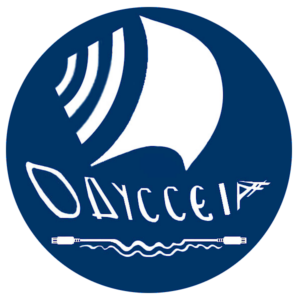 Δὲν εἶναι ἰδεατά, δὲν ζοῦμε σὲ κοινωνία «ἀγγέλων» καὶ δυστυχῶς ἡ γήινος βίος εἶναι πολὺ συγκεντρωτικὸς γιὰ κάποιους!!! Ὁ/ἡ Pavlos γράφει:	 28 Ἰουνίου 2012, 2:37 μ.μ. ΤΙ ΑΣΤΑΝΑ ΡΕ ΦΙΛΟΝΟΗ ? Ὁ/ἡ Φιλονόη ἐκ τοῦ Πόντου γράφει:	 28 Ἰουνίου 2012, 5:17 μ.μ. Ὁ/ἡ Pavlos γράφει:	 29 Ἰουνίου 2012, 1:37 μ.μ. Τι να σου πω και εγω ….. δεν του πηρα και αιμα για να του κανω αναλυση ! Παντως εγω, σου το λεω να το ξερεις δηλαδη, δεν εμπιστευομαι κανενα, μα κανενα κερατα ! 1. Εσυ δηλαδη θαθελες ….. παιδι απο ενα τετοιο …. ον ? 2α. Θα του εμπιστευοσουν τη μικρη σου αδελφουλα να την παει βολτα στο παρκο ? 2β. Εαν ναι, για ποση ωρα ? 3. Θα αγοραζες μεταχειρισμενο αμαξι απο ενα τετοιο …. ον ? 4. Αμα σε εκανε τσακωτη, 14 Φλεβαρη,….. και στο πρωτο κουτουκι, με ενα παλιο σου αμαρτωλο φιλαρακι, θα περιμενες να αποδεχτει το οτι … βρεθηκατε τυχαια ? 5. Αμα του εκανες – γενικως μιλαμε τωρα – αλλη “πουστια” θα περιμενες να λαβης …. συχωρηση ? 6. Πες οτι μαλωσατε, και εσυ του ριχνεις φουσκο στο ενα μαγουλο…. τι περιμενεις οτι θα σου πει, “βαρα και το αλλο” ? 7. Πες οτι πατε ρε παιδι μου στο καρναβαλι Πατρας ντυμενοι Αρχαιοι Ελληνες με ρουχα Σπαρτιατικα, (ευκαιρια για να κανεις και λιγο την… φαινομηριδα) αλλα ομως κανει ενα διαβολεμενο κρυο, και αυτος εχει δυο χιτωνες, λες να σου εδινε τον ενα ? Ὁ/ἡ Φιλονόη ἐκ τοῦ Πόντου γράφει:	 29 Ἰουνίου 2012, 2:01 μ.μ. Ὁ/ἡ Pavlos γράφει:	 5 Ἰουλίου 2012, 9:10 π.μ. Ρε συ Φιλονοη, τη Μαρια τη Σαραποβα τι την εχεις ? Τελευταια φορα που με “τρεχανε” ετσι με τετοιο τροπο, ητανε σε τεραιν του τενις ! Ωραια, και με ποιο τροπο να εξετασουμε το εαν Ὑπάρχει ἕνα τέτοιο ὄν ? Ὁ/ἡ Φιλονόη ἐκ τοῦ Πόντου γράφει:	 5 Ἰουλίου 2012, 11:30 π.μ. 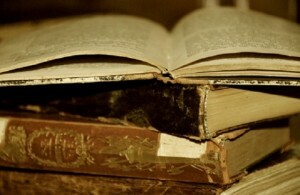 Ἡ λεπτομέρεια σὲ ὅλα αὐτὰ Παῦλε εἶναι τὸ τὶ θέλουμε νὰ πιστεύουμε. 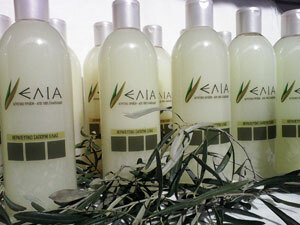 Ἐὰν ἐμεῖς πιστεύουμε κάτι, τότε αὐτὸ «δημιουργεῖται» σὲ κάποιαν μορφὴ τῆς πραγματικότητός μας. Συνεπῶς, μόνον ἐμεῖς ἀποφασίζουμε γιὰ τὸ ἐὰν, ἤ ὄχι, ὑπάρχει. Τόσο ἀπλᾷ! 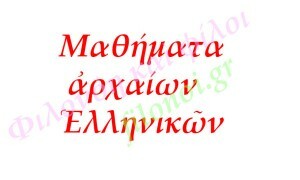 Ὁ/ἡ Christos γράφει:	 11 Σεπτεμβρίου 2012, 11:20 π.μ. Η αλήθεια είναι ότι οι ερωτήσεις είναι εύκολες, οι απαντήσεις είναι δύσκολες!! Ὁ/ἡ Φιλονόη γράφει:	 13 Σεπτεμβρίου 2012, 5:11 π.μ. Τὸ ξέρω.. Ἀλλὰ λίγος προβληματισμ]ς κακὸ δὲν κάνει ποτέ! Ὁ/ἡ armored γράφει:	 27 Μαρτίου 2013, 9:12 μ.μ. Για να σας βάλω περισσότερε σε σκέψεις το Αστανα με πολυ απλο αναγραμματισμό 2ο γραμμα πρωτο και 1ο στο 2ο βγάζει την λέξη σατανά. Πέραν όμως αυτού του εβραιοκαταγόμενου συστήματος καλού-κακού για κάποιους αυτό μπορεί να σημαίνει κατι παραπάνω από άπιστους στα εβραικά ,δεν σημαίνει λοιπόν ότι δεν πρέπει να του δώσουμε κάποια προσεκτικότερη ματιά. Επίσης και περίεργες φυλές έρχοντα από την ρίζα του Καυκάσου ( διόλου τυχαίο για να αποπροσανατολίσει τον κόσμο η σιωνιστική εβραίλα προώθησε τον όρο Caucasian για τον λευκό – που δεν είναι. Ενώ τα μιαρά φύλα των οβραίων είναι. Καί πολλά άλλα για τον καύκασο υπάρχουν ψάχτε βρείτε. Ὁ/ἡ Φιλονόη γράφει:	 28 Μαρτίου 2013, 7:16 μ.μ. 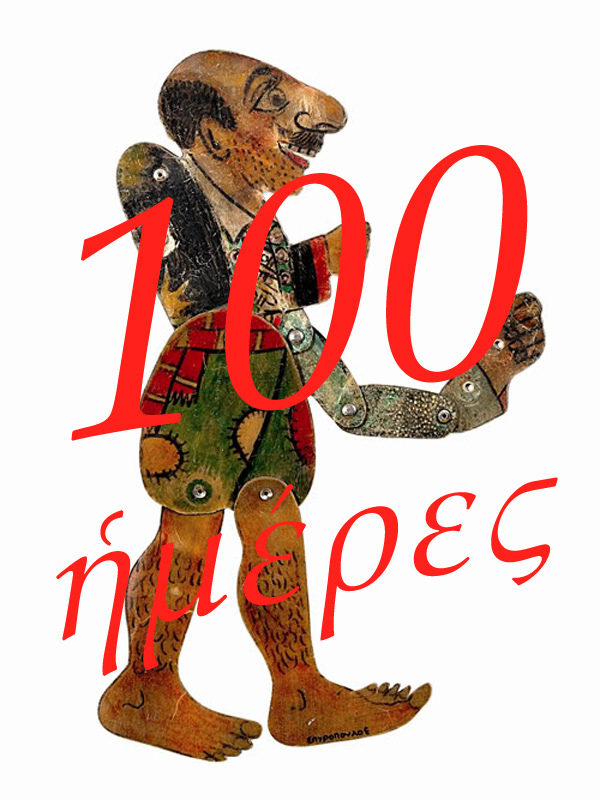 Ὁ/ἡ Φιλονόη ἐκ Πόντου γράφει:	 11 Μαΐου 2015, 12:00 μ.μ. Ὁ/ἡ νικος μπελλος γράφει:	 16 Ἰουλίου 2015, 4:27 μ.μ. 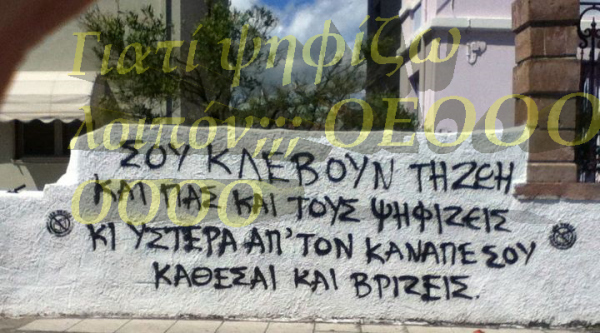 Ὁ/ἡ Φιλονόη ἐκ Πόντου γράφει:	 16 Ἰουλίου 2015, 10:12 μ.μ.